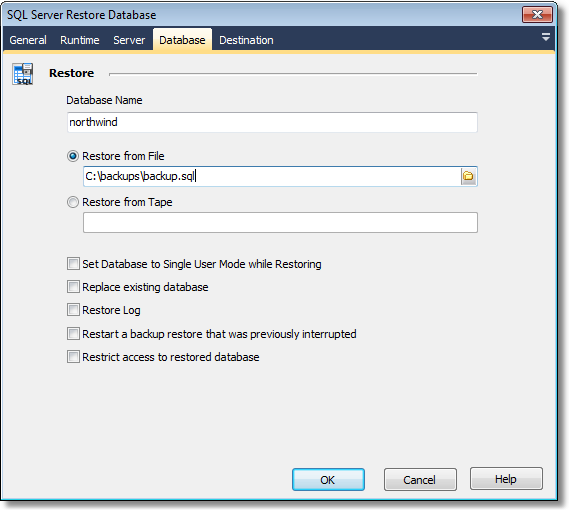 The SQL Server Restore Database action enables you to restore a SQL database from a disk or tape drive. The name of the database to restore to. The path of the backup file to be restored. The path must be accessible by SQL Server. The name of the tape drive to restore the database from, i.e. '\\.\TAPE0'. The database will be set to single user mode before the restore procedure starts, then changed back to multi-user once completed. Forces SQL Server to create the specified database and related files even if a database with an existing name already exists. If a previous restore attempt was interrupted, SQL Server will restore from the point where the last attempt was interrupted. Restricts access to the newly restored database to members of the db_owner, dbcreator and sysadmin roles.